THIS POST IS A YEAR IN THE MAKING. Today’s brief analysis of US Treasury Yield curves and the Debt profiles of both the USA and Italy highlights the enduring question in the title of this post. The key take-away from the Yield Curve comparison is that even with a ratings downgrade, the US is actually able to borrow new capital at a lower rate of interest 6 months on. However, to pour a bit of realism into the analysis, we highlight two interesting Debt profile graphics below. 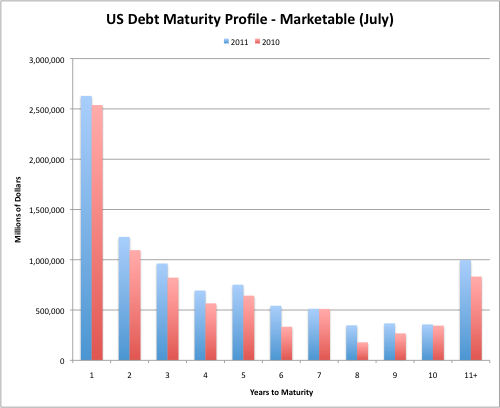 The first one is the USA Treasury Maturity curve (admittedly 6 months out of date), highlighting when the current debt will need to be redeemed or rolled over. 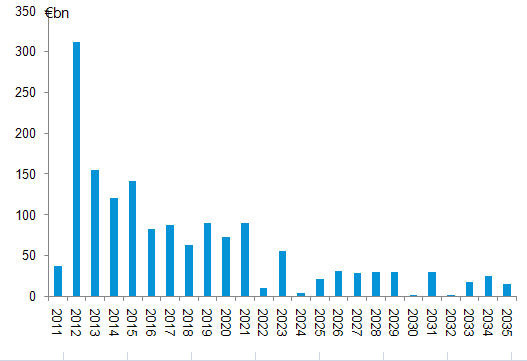 The second is the Italian Bond Maturity curve. You will notice just how similar the USA and Italy Debt Maturity profiles are. 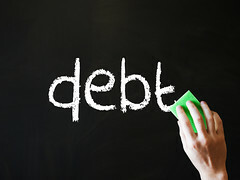 Where will all the new money come from to roll over the debt maturing during the next 3 – 12 months? QE is one option, but investors still need to be convinced that their capital is safe and relatively risk-free. It is the Risk-free equation (or investor risk appetites) that needs to be explored in more detail.